The ultimate Moshling Collector’s handbook, packed with tips from MonstroCity’s top expert, Smudge Blunderpaws! Meet all the cute little Moshlings roaming wild in the colourful world of MoshiMonsters. Discover all kinds of helpful hints on planting the right seeds to attract them – and then keep them entertained once you adopt them! With handy notes and diary extracts from Smudge, plus profiles, likes/dislikes, a cool poster and an EXCLUSIVE secret Moshling available only with this guide, it’s your one-stop springboard into successful Moshling adoption! Includes a fold-out poster. This gives you information on all the moshlings and how to find them. i love this book! 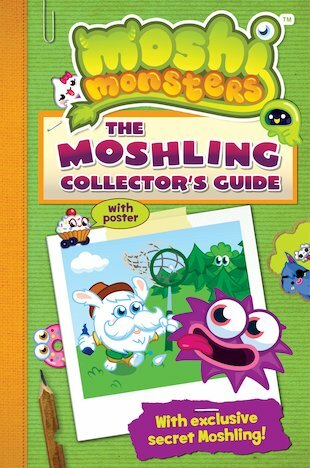 it tells you about ALL the moshlings you should read it! i give it 9 out of ten! I have the newer version of this but the old version is just as good. I think it is very helpful to all Moshling hunters! I would recomend it to 7+!